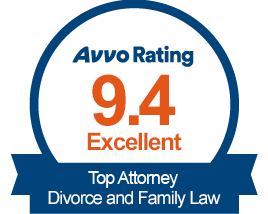 The law firm in the Anaheim area that you choose is going to make all the difference in your alimony case. At The Goldberg Legal Group, we will help you tackle your case and get you closer to the results you need. The Goldberg Legal Group, is a full-service alimony firm, working with clients in the Anaheim area and other areas throughout the states. Our alimony firm provides clear, reliable legal guidance and representation based upon 13 Years of relevant case experience. Let The Goldberg Legal Group, in the Anaheim area give you the legal support that you need and deserve. No matter how difficult your alimony matter might be, our 13 Years of experience in the field allows us to put our knowledge to work for you and together we can come up with a plan that we can both get behind. 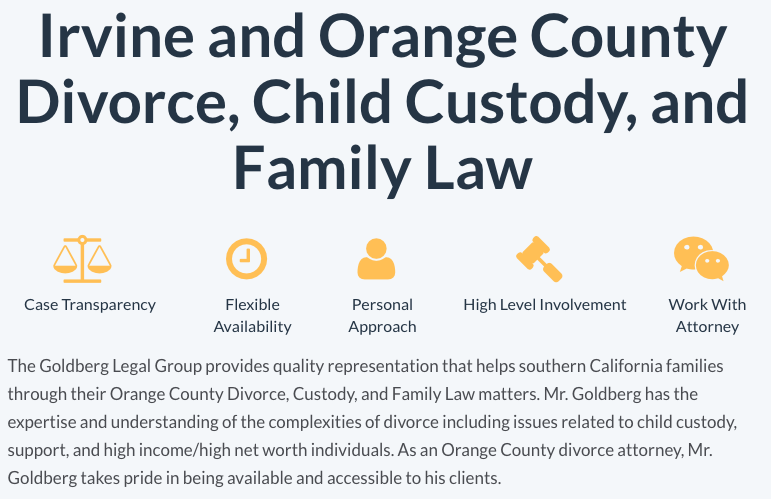 The Goldberg Legal Group understands the financial pressures that people in the Anaheim region and across the country face paying for legal services. 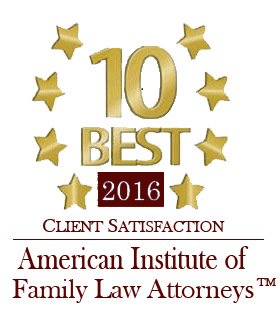 You take a big leap of faith trusting us to handle your alimony case, and we try everyday to honor that trust. 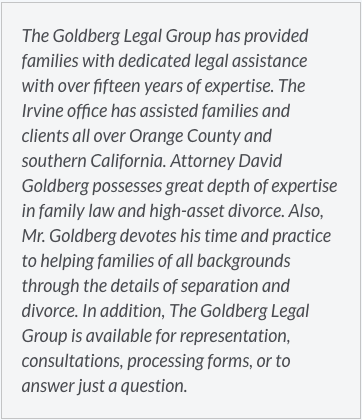 Contact The Goldberg Legal Group with the information below for a consultation. 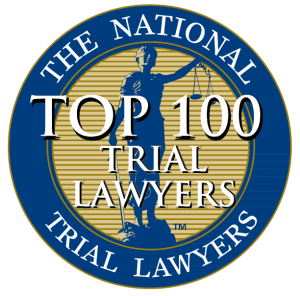 I worked with David on settling a personal injury case from a car accident. 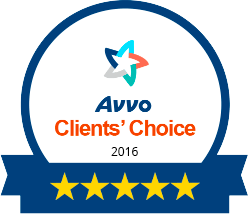 He was very professional, knowledgeable, and did everything he could to get the most out of my settlement. He always kept in contact with me and let me know everything that was going on. Overall it was a great experience and I would definitely work with David again. David Goldberg did a great job handling the dissolution of domestic partnership/civil union between my (now) ex-partner & I. While dealing with a very difficult time in life, he helped me to stay focused on what was necessary in the divorce process, to ensure my best interest. He fought for me through difficult negotiations, and didn’t back down from my ex’s (very) pushy attorney. He was very professional, and knowledgeable. I was in a child custody situation and desperately in need of experienced legal advice. Mr. Goldberg met with me on short notice and produced immediate results. He returns every email and phone call promptly. He is sharp, reliable and extremely knowledgeable. Excellent is an under statement, wish I could give him ore than 5 stars. What a great and refreshing experience to have a professional answer the phone on your first call and give you guidance towards finding what works for you! 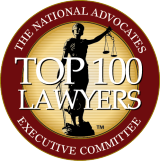 David is a great asset to have on your legal team. He can act both as your lawyer in court, as well as, a guide who explains the best way to settle your case. He is very driven towards reaching a settlement and prefers not to waste the court’s time. He knows the Orange County court system extremely well and helps you navigate it. I couldn’t sleep because a family law matter was bothering me. David quickly got through my ramble and asked specific questions to hone in on the variables and gave me a informed answer. He ended up helping me on some other issues pertaining to my case and talked through my options as he saw them based on the knowledge he had. My case involved divorce and child custody. From the moment I talked to Mr. Goldberg on the phone to schedule the initial meeting, he put me on the right track. We met the next day for two hours for no charge. Mr. Goldberg explained to me the process from beginning to end and all available options as well as their costs. Mr. Goldberg listened carefully, assessed my situation, and then recommended the best options that weren’t necessarily the highest cost as other lawyers did. Mr. Goldberg is knowledgeable, thorough and manages his work with integrity. I had a lot of problems dealing with an Insurance company on my own. Mr. Goldberg was able to help me with the paperwork needed for my case at a reasonable rate. I interviewed 3 attorneys before I settled on David. He listened to what my needs were & helped to facilitate my divorce in what I believe was the most pragmatic, simple & straightforward manner. David was extremely professional & always returned my correspondence quickly. I felt that his fees were very reasonable for the services he provided. Overall, I couldn’t have hoped for an easier process, & am happy with my decision to have hired David as my attorney. My ex was attempting to rake me over the coals by claiming she was owed more support and property then she deserved. I was overwhelmed and I was not interested in going through a long bitter divorce. I just wanted something fair. Mr. Goldberg made the whole thing easy and reasonable. After some negotiations, we were able to reach an agreement that I could live with and I didn’t have to pay tens of thousands of dollars to do it.